"It is a beautiful song. It has been a good day. Everyone, everyone, everyone, everyone has cake." Now, I imagine you are wondering how all those words fit together in a story. Truth be told, this isn't at all an ordinary book. In fact, it is very odd. But, with Lemony Snicket as the author, one doesn't expect something ordinary! The story starts out with a despondent bird. The poor blue bird is sad, very sad, so a dog does his best to cheer her up, with the help of a convertible driving goat and song-spinning mezzo-soprano. After an eventful day involving hats and more, they all eat cake. The book ends with a quote by Albert Einstein, "The only reason for time is so that everything doesn't happen at once." 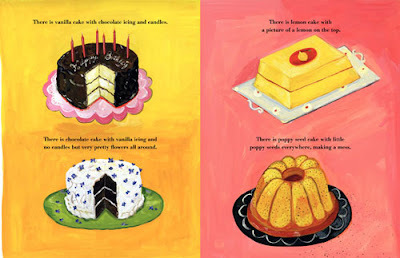 Maira Kalman’s whimsical illustrations add to the quirkiness. The humor found in the pictures is just as strange and funny as the text, but the illustrations also convey a much deeper feeling of loneliness and sadness. Underneath a dark rain cloud, a despondent bird sits perched on top a can of mushy peas right next to a book by Kafka? Unusual, yes? I found the book extremely intriguing. It is both simple and complex at the same time, and school-aged and adult readers will enjoy drawing their own conclusions about the story. My daughter loved learning a few new words and also liked that the book also used some "easy words" for beginning readers. And, of course, a big thumbs up for all the cake, especially the birthday cake with six candles! Lately we've spent a lot of time exploring words. With a beginning reader in the house, our goal is to foster a love of language and of words. 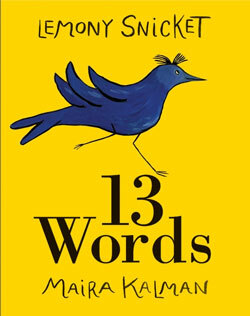 13 Words provides a fun way to show how random words can connect together to form a story. It is indeed, like the publicity release indicates, "a launch pad for creative minds of all ages." My dog eats cake. When I give him a little bone he wags his tail. And he likes me to look up at the sky. I see a cloud. He is two years old. This is how I play with my dog. 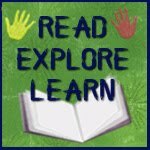 Find more great book tie-ins at JDaniel4's Mom Read, Explore, Learn link-up and more writing ideas at Giggles and Crayons' Writer's World. I love her story. The books is an awesome way to introduce new vocabulary. Love the tie-in. I am going to look for this book. We have only read one Lemony Snicket book so far, but C loved it. Great sight word activity too! Love the creativity inherent in this idea! Great idea for an activity. My daughter loved this book. We loved the words haberdashery, despondent, and panache. Since, reading we have encountered the word despondent on three occasions. Each time, my daughter and I looked at each other and said, "Hey!, just like 13 words!" I LOVE this activity; it's one my son would really enjoy. I'm definitely going to try it this week. Thanks! I'll also add the book to my list of books to hunt down. I've been bad about getting to the library lately as we've been sick, so we definitely need a new batch of books. 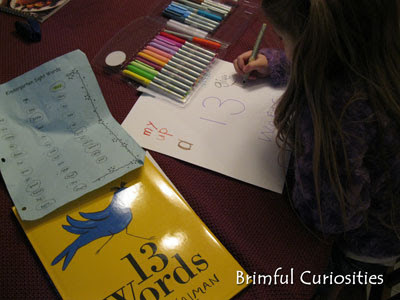 I love the idea of the 13 sight word story. A great way to tie in the book with younger readers/writers. Great tie-in. And, good story!! I will have to look for that book. My seven year old enjoys quirky stories- this looks like it might fit the bill. Thanks for sharing. Love the idea of using your daughter's sight word list to create a story. I let my grandson play with Magnetic Poetry's REALLY BIG WORDS kit on the refrigerator, experimenting with how to make sentences as a pre-reading exercise. He loved the silliness.